Full selection of polyethylene foam in rolls for the protection of delicate products and mechanisms during shipping for a growing a growing number of luxury consumer goods and high-tech and industrial companies. Polyethylene foam is finding increased application in protecting electronic components, jewelry, artwork and many other especially delicate and sensitive products and mechanisms in an expanding number of industries. The foam provides superior protection by absorbing shock during transport. Because the foam is a highly flexible wrapping material, it is capable of interleaving and cushioning the contents of packages. The foam is non-abrasive, so it gives excellent surface protection and does not scratch or damage finely finished surfaces. 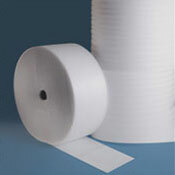 It is also clean and lint- and dust-free, reducing the possibility of marking or contaminating products. Its closed-cell construction means that it is dust and moisture repellent. The way to achieve the best protection is to wrap the items in polyethylene foam. In addition, the foam can be used to line the bottom, top and sides of a box, which adds cushioning for additional protection in case the box is dropped or impacted from other packages during shipment. Foam sheets can also be used for layering products in a box. 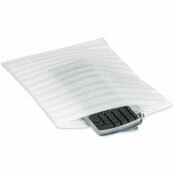 Placing a foam sheet between layers of products saves time and money, when compared to wrapping each item individually. 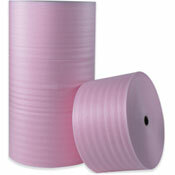 Polyethylene foam is lightweight, so it reduces package weight and lowers production and shipping costs. Too often, companies do not select the right foam thickness. The thickness should be sufficient to protect delicate items, but not excessively thick for durable items to increase costs unnecessarily. Also, anti-static foam should be used when shipping electronics products, to avoid static discharge and damage to sensitive electronic components. Wrapping items too tightly decreases the amount of protection the foam is able to provide them because the items absorb any shipping shocks instead of the foam. Polyethylene foam is manufactured from 100% low-density polyethylene, without the use of CFCs or HCFCs, so it is environmentally friendly and 100% recyclable. It is available in both standard and anti-static varieties. 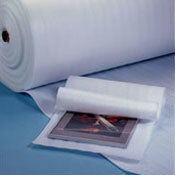 The foam is available in rolls in thickness of 1/16 and 1/8, 1/4, 3/16 and 1/2 inch, in widths of 4 inches to 72 inches. Roll lengths available vary with the thickness: 1/8 inch has 550 feet per roll, 1/4 inch has 250 feet per roll, and 1/16 inch has 1,250 feet per roll. The foam can be converted into custom sheets.